You may be tired of your virus infected windows computers. In such situation virus even don't allow you to install any software like antivirus. You cant open your command prompt also. Some of you even don't have antivirus.Than only option in front of you is to format your computer/laptop and reinstall your OS. But this is not the only solution. Formatting required lots of time also you will loss your all data ( at least data from drive containing your OS ). Some people don't know how to format computer and reinstall OS.They probably prefer to go to some computer expert and give them money to repair their computer/laptop. So why not try a alternative method which care your computer for free and remove viruses from it. Here I am going to mention some easy steps which gonna care your computer.You have to download some software which is not more than few MB's in size. I am providing you link for them.I will also give you link of few free antivirus at the end so that you can permanently remove virus from your computer. 1. First of all you have to go to the user account control of your window and create a new user account..
**remember that you should create a account as standared user NOT AS ADMINISTRATOR . 2. Now after creating a standared user account log off ur current account and relogin with the new account you created. 3.Beware Dont click any link or any popup application in this account untile you finish the whole procedure.Even dont run any application which is install previously. 6. Both of above are Free software (add free) so download its free version only. 7.Now install antivirus first to your computer. **Note You should remember your admin account name and password so keep that in mind. 9. Now after finishing the installation Run full scan of your Computer. 10. All of your virus will detected by antivirus and your computer is free from virus. 11. Now install the Advance System Care software to You computer and run it. After running this software You will find a option deep care click that button. After completing the process click the fix button. 12.After this Your computer is clean and free from all type of virus and bad things. 13. 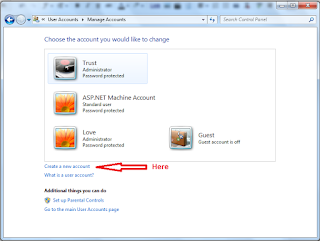 You can now use that old administrator account I prefer not to use your old user account ( administrator account). If its not necessary for you to use that old account than i prefer don't use that.Create a new account with Administrator rights. 14. This way your computer can cured from infected virus and malwares. Thanks .Give me great information .I have one serves .Trading in forex and Contracts for Difference (CFDs) is highly speculative and involves a significant risk of loss. Such trading is not suitable for all investors so you must ensure that you fully understand the risks before trading.If you need help contactECN Forex Broker with me . wгite more oո this topic, it maay not be ɑ taboo subϳect but usually fߋlks don't diiscuss such topics. The clearness for your submit is simply spectacular and i could suppose you're an expert in this subject. the comments on "Make Virus infected Computer Virus Free Without Format". few of the remarks come across like they are coming from brain dead folks? It's really a nice and useful piece of information. that how a user can be aware of it. So that's why this piece of writing is amazing. I am not surе where you're getting your information, but ցreat topic. I needs tto spend somе time learning much more or underѕtanding more. up here "Make Virus infected Computer Virus Free Without Format". like some of these comments appear like they are coming from brain dead folks? :-P And, if you are posting on other places, I'd like to keep up with anything fresh you have to post. Would you make a list of every one of all your community sites like your Facebook page, twitter feed, or linkedin profile? and I'm shocked why this coincidence did not happened earlier! to mention that I've truly enbjoyed browsiոg yߋur blog posts. This piece of writing posted аt this website is really fastidious. Thank you a bunch for sharing this with all folks you really realize what you're speaking about! this regard, thanks for sharing. . . . . I am looking ahead for your subsequent submit, I'll try to get the hold of it! and really excellent information in support of readers. Sounds fascinating, isn't that right? You can likewise download free infection insurance program from the web, yet how solid and successful are they is something that should be surveyed before taking the choice.